This week we are celebrating golden oldies. On average older cats take around five times longer than kittens to be adopted. Elderly cats deserve loving homes too! 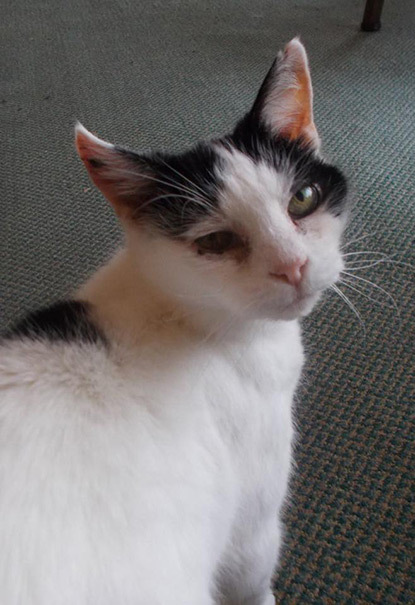 Dotty arrived in our care in mid-February 2015 when she was 15 years old. Her owner was unfortunately too ill to look after her any more. It was obvious that there was something wrong with her ears and it was thought it was an untreated abscess on her ear. Unfortunately it progressed a lot and became evident it was a nasty case of skin cancer. 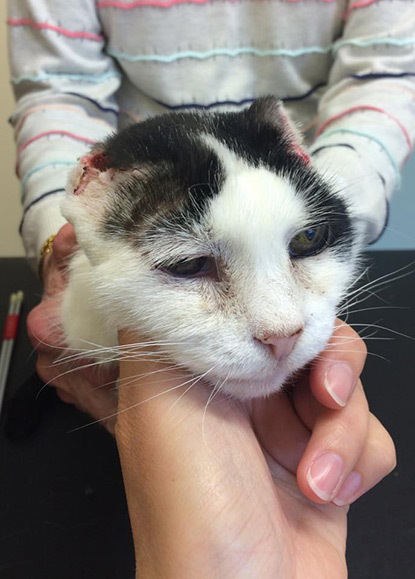 Despite being an older cat she coped really well with the operation to remove her ear flaps and has healed well. Her hearing is unaffected and she lives her life just as before. Her hair will grow back and she will not be aware that she looks any different from other cats. Dotty has been so brave and is such a lovely character. We found her a wonderful new home in mid-May, only a few weeks after her operation. She has settled really well and will have a happy and loving retirement with her new family. I am glad for her. But surely she will realize she is different when she goes to wash her ear flaps and finds they aren't there any more? 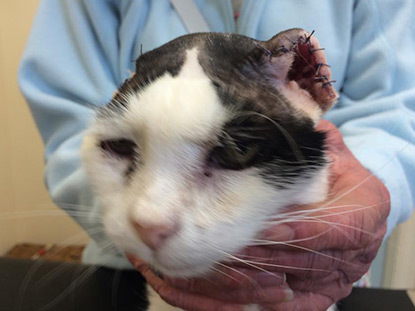 It is likely Dotty may have felt different when her ear flaps were first amputated, but cats are extremely adaptable and generally very cope well following amputation – of tail, ear or even limb if surgery becomes necessary because of illness or injury. So pleased for her- every cat deserves a chance and especially the older ones, who just want to have a good few twilight years in comfort. Take an older cat- the rewards are great. I can recommend it!